Post all Blood Ties news here. We made the top 40! Way to go guys!! May 31 is the deadline for the Blood Ties Posters. Order from Blood Ties official site. 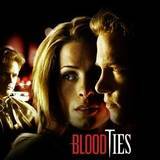 Here is the link to Amazon about the Blood Ties DVD set. No release date yet but you can sign up to be emailed when it is available. Here is what one of the writers of BT had to say about the show. It is long and depressing but thought I’d put it out there. 21st Floor, 30 Rockefeller Plaza, New York, NY 10112. If you must send e-mail, send it to feedback@scifi.com. Alternatively, if you’d like to voice your feelings in a public forum, you can send a letter to the editor of Science Fiction Weekly at scifiweekly@scifi.com. Tanya Huff’s offical web site. Poll for any of our Top 40 shows are ignored. Ties in the Nomination Poll will not be counted. period or your votes will be thrown out. Billboard Jerico’s fans put up for the next month. Board owned by CBS, priceless. This is an official announcement on behalf of the Variety Ad Committee. WE are elated to be able to make this announcement to all Blood Ties Fans. We did it! The Ads will officially begin running on Variety.com for five consecutive days, with the launch beginning on June 9 and continuing until June 15. The ads will be programmed to run intermittently in the following three sections of Variety: to appear on the home page, in the film section, and additionally, in the awards section. While we realize that Blood Ties was a television production, we were advised that in order to reach the DPT in the biz….these were the best fit options for maximum exposure. In addition, this week was chosen primarily because it is the week of the daytime Emmy’s. Our consultant considers this an ideal week for the ads to garner maximum attention, exposure and coverage for the business. Please, remember the ads will be running on-line, they will not be stationery, they will be programmed to alternate either between one another, pop-up together, or to appear between the three pages together or apart of one another as listed above for viewing, so you may have to watch the screen(s) a bit for the appearance of one or both. We will place the static page of the ads, as soon as, they are received from Variety for viewing. 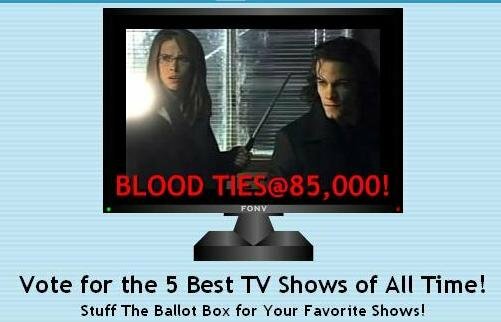 There will be a link provided to revert all inquiries directly back to: http://www.bloodtie stv.com/ . We are also, including the link to the Variety site for your convenience: http://www.variety. com/ We additionally, increased the impressions to a reasonable maximum, thanks in part to the generous donations of the fans. $3,700.00. The remaining balance of $800.00 will donated to the “Best Friends of Animals Society”, in honor of: Dylan, Kyle and Christina. We are very excited and sincerely hope that everyone enjoys the Ads. Lets all keep our fingers crossed that the Ads can work a “Bit of Magic” for the actors and the show. This could not have been accomplished without ALL THE DEDICATED AND DEVOTED BLOOD TIES FANS…….remember “Blood Ties Fans” can still bite back! Again, to all Blood Ties Fans “Thanks So Very Much for Your Support” of the Ads. We are very proud of the ads and hope you will enjoy seeing them running in Variety.com. This is the press release that Margaret and I have sent to EVERYONE that we could think of. But, I don’t see any reason not to send it a few more times from different people. So feel free to use this whereever you see fit. This is such a huge project and we have all worked so hard together to make it happen. Thank you all for everything you have done or not done to help. The fans of Blood Ties have united in an attempt to secure future episodes of the show are made. In their biggest effort yet they have purchased an online ad to run on Variety.com during the week of June 9 through June 15, 2008. They are running this ad in the hopes of encouraging a network to pick the show up for the fall 2008 season. This series originally premiered March 11, 2007 on Lifetime and ran for two seasons. Blood Ties is about a strong woman, a survivor, who is dragged into this supernatural world and is the link between existence and total annihilation. It may sound very dramatic but it is funny where it can be and the chemistry between the characters is electric. During the two seasons, the viewers became attached to the show and began campaigns to continue the show even before there was any mention of cancellation by Lifetime. It has been verified that Lifetime will not be broadcasting any additional episodes past the originally purchased 22 episodes. The two ads that were purchased will be on rotation at Variety.com until June 15, 2008. The ad in Variety.com was paid for entirely by fan donations, with an excess of $800.00 donated to The Best Friends Animal Society in the actors’ names. This should show you how incredibly loyal the show’s fan base is. We are writing to you, because we can’t give up. This show is too special and we’ve come too far to fail. Kyle’s interview on Deep Cove. Rumor is they are purchasing the rights to Blood Ties in August. Let’s let them know we would support the show and want new episodes. If CTV Televesion Network picks up Blood Ties, will we be able to see it in the U.S.? Kyle has cancelled his Pittsburgh appearance due to a work related scheduling conflict. Tickets to his events will be refunded or they will switch them to another convention he’s at. The Blood Ties Podcast with our own Fitzgirl! Link to nominate your fav fanfic. Season 1 of Blood Ties is now available on DVD.